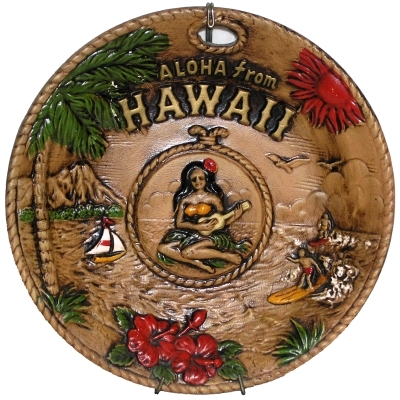 This souvenir plate depicts a scene from Hawaii. In the center of the plate is a kneeling wahine playing a ukulele. She is wearing a grass skirt and has a red hibiscus flower in her hair. To the left of her are two men riding surfboards and to her left is a small sailboat with mountainous island in the background and a palm tree and hibiscus flowers in the foreground. A blue and white sticker on the reverse reads “Made in Japan”. Stamped, in ink, is “FOR DECORATIVE PURPOSE ONLY NOT FOR FOOD USE”. There are no other identifying marks. This plate can be found on page 168 of Treasure Craft Pottery & Pottery Craft Stoneware by George A. Higby. Found in the Hawaiiana and Plate Collections. This Coco Joe’s figurine is made from pulverized lava mixed with resin. It depicts a man riding a surfboard with a large wave curling over him. Inscribed on the bottom is “290″, “Coco Joe’s”, “Lava”, and “Made in Hawaii”. On the front in raised lettering is the word “Hawaii”. 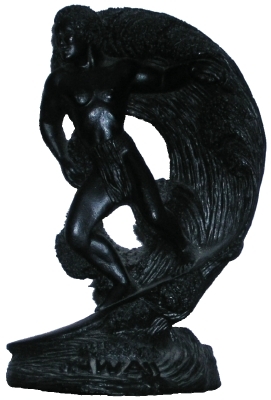 Similar figurines can be found on page 180 of Tiki Quest - Collecting the Exotic Past by Duke Carter. Found in the Coco Joe's, Figurine, Hawaiiana, and Polynesian Pop Collections. This Coco Joe’s figurine is made from pulverized lava mixed with resin. It depicts a sitting, naked woman, with a hibiscus flower over her right ear, holding a lei. Inscribed in the figurine is “Made in Hawaii with lava by CoCo Joe #289″. On the bottom is a black-and-gold decal that says “Made in Hawaii with lava by Coco Joe’s”. 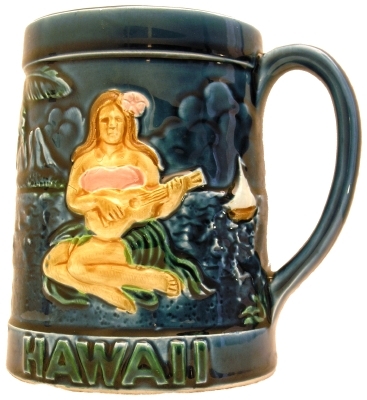 This glazed mug features a woman kneeling on the beach playing a ukulele. On the base of the mug can be seen the word “Hawaii”. On the back are three salmon-colored hibiscus flowers. Behind the girl can be seen a sailboat and an island. The mug has some crazing and a small spot where there is no glazing but otherwise it appears in good condition. Found in the Hawaiiana, Mug, and Polynesian Pop Collections. This all-white, eight-ounce, glazed ceramic mug stands 4 1/2-inches tall. It was made for the Hawaiian Village, a now-closed Polynesian restaurant located in New Westminster, BC, Canada. Hawaiian Village is mentioned on page 230 of Tiki Road Trip by James Teitelbaum. 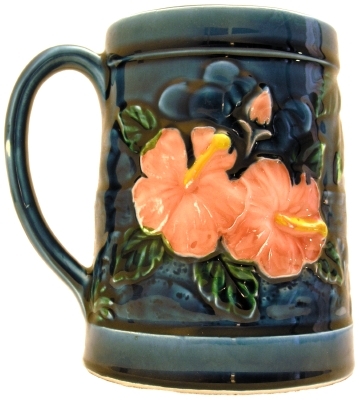 The front of the mug depicts a Hawaiian woman with a hibiscus over her left ear and a lei about her neck. On the front it reads “Hawaiian Village” and “525-9222″ and on the bottom is imprinted “Ernelli”, “Vancouver, Canada” and “Made in Japan”. Found in the Hawaiiana, Labeled, Mug, and Polynesian Pop Collections. This glazed ceramic mug , most likely a reproduction of the Orchids of Hawaii R-80A Surfing Girl mug, was produced for the Hawaiian Village, a now-closed Polynesian restaurant located in New Westminster, BC, Canada. 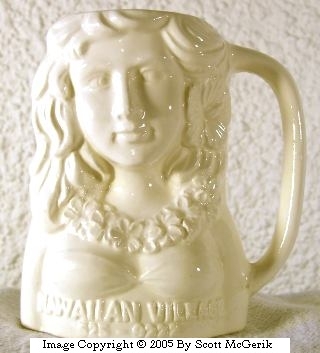 Hawaiian Village is mentioned on page 230 of Tiki Road Trip by James Teitelbaum and variants of this mug can be found on page 93 of Tiki Quest - Collecting the Exotic Past by Duke Carter. This mug stands 6 3/4-inches tall and holds twelve ounces. On the front is brown-haired woman, wearing a blue bikini, riding a yellow surfboard. On the back are five dolphins jumping in the ocean. Also on the back are “Aloha”, “Hawaiian Village”, and “525-9222″. Similar mugs in my collection include an Orchids of Hawaii R-80A Surfing Girl mug and an unidentified Surfing Girl mug. Found in the Hawaiiana, Labeled, Mug, Polynesian Pop, and Tiki Collections. 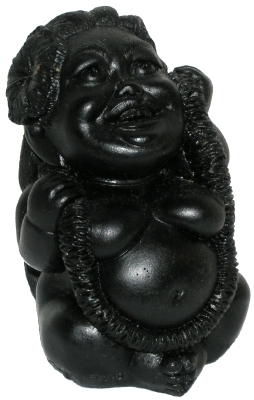 This figurine of a Tiki, produced by Hip Original, is made from pulverized lava mixed with resin. In raised lettering on the front is the word “Hawaii” and inscribed on the bottom is “Made in Hawaii”, “Hip Original”, and “1973″. Found in the Figurine, Hawaiiana, Polynesian Pop, and Tiki Collections. At nine ounces, these vintage glazed ceramic mugs, produced by Orchids of Hawaii, are small. On the mugs is a dancing woman. She is wearing a grass skirt and has yellow lei around her neck and a red or purple hibiscus in her hair. All four mugs are marked “Orchids of Hawaii” and “Japan” on the bottom. However, the two lighter called mugs, on the left, are additionally marked “R-73A”. The variations in color highlight the handpainted nature of these classic mugs. These and similar mugs can be found on page 91 of Tiki Quest - Collecting the Exotic Past by Duke Carter. Found in the Hawaiiana, Mug, Orchids of Hawaii, and Polynesian Pop Collections. 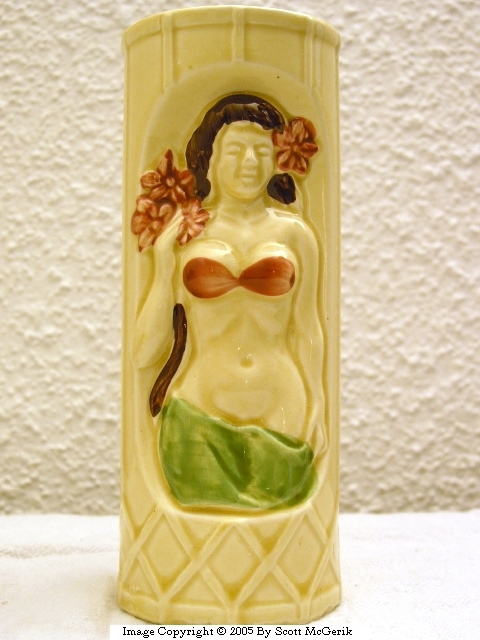 This vintage cream-colored Tiki mug is fully glazed and features a suggestively-clad buxom girl with hibiscus flowers in her hair. This 13 ounce mug stands 6.75 inches tall and 3 inches wide. Inscribed on the bottom of the mug are “Orchids of Hawaii”, “Japan”, and “R-79″. Similar mugs in my collection include the Dynasty Wholesale DW141 Bikini Girl mug. Variants of this mug can be found on page 89 of Tiki Quest - Collecting the Exotic Past by Duke Carter. This 14-ounce, all-blue, vintage glazed ceramic mug stands 7-inches tall. It depicts a man riding a surfboard with waves crashing around him. On the back can be seen another person riding a surfboard in the distance. On the bottom is imprinted “Orchids of Hawaii R-80″ and “Japan”. This mug is shown on page 93 of Tiki Quest - Collecting the Exotic Past by Duke Carter. This 14-ounce, colorful, vintage, glazed ceramic mug stands 7-inches tall. It depicts a girl riding a surfboard with waves crashing around her. On the back can be seen dolphins jumping in the ocean with a mountainous island in the background. On the bottom is imprinted “Orchids of Hawaii R-80A” and “Japan”. Similar mugs in my collections include a Hawaiian Village Surfing Girl mug and an unidentified Surfing Girl mug. This 22-ounce, vintage, glazed ceramic bowl stands 3 3/4-inches tall. On the front are three wahine on a beach. One woman is playing the ukulele while the other two dance. The dark-haired women are wearing green grass skirts and red leis. The scene is framed by two palm trees. On the reverse side are two pineapples. On the bottom is imprinted “Orchids of Hawaii R-86″ and “Taiwan”. Bowls similar to this in my collection include the Dynasty Wholesale DW117-s Compote bowl. 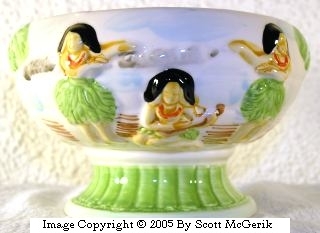 Variants of this bowl are shown on page 83 of Tiki Quest - Collecting the Exotic Past by Duke Carter. Found in the Bowl, Hawaiiana, Orchids of Hawaii, and Polynesian Pop Collections. 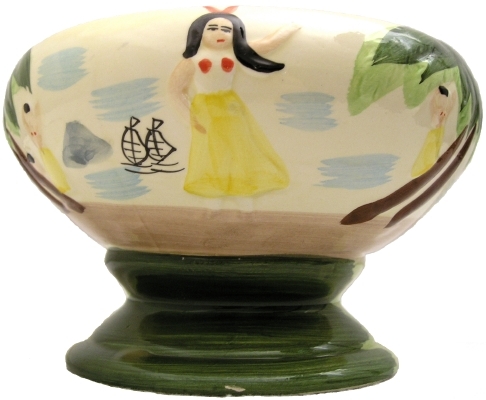 This glazed, ceramic mug, which depicts a woman riding a surfboard, is similar to the Orchids of Hawaii R-80A Surfing Girl mug and a mug from the Hawaiian Village restaurant. The only markings on this mug is “Made in China” on the bottom. 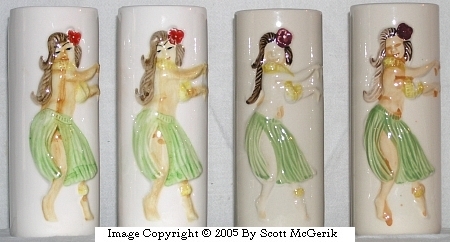 Mugs similar to this one can be found on page 93 of Tiki Quest - Collecting the Exotic Past by Duke Carter. This hand-painted ceramic mug features, in bas-relief, a buxom, dark-haired woman wearing a brown dress with red hibiscus flowers and green palm fronds on it. She has a red hibiscus flower in her hair and is holding a woven backet, full of pineapples, in her left arm. She is standing on green grass against a blue background. On the base of the mug in white lettering is “Tommy Bahama”. On the bottom of the mug is “Tommy Bahama”, “Tropical Nostalgia”, “2003″, and “Hand Made in China”. Also, impressed on the bottom is the letter “W”. Tommy Bahama has released a series of mugs featuring a wahine, one each year, since 2002. This mug, titled “Tropical Nostalgia”, was released in 2003. Others include “Kimono Lady“, released in 2002, “Vacation Vixen“, released in 2004, “Just Duet” in 2005, and “Paradise Beach” in 2006. Found in the Hawaiiana, Mug, Polynesian Pop, and Tommy Bahama Collections. This hand-painted ceramic mug features, in bas-relief, a wahine kneeling on a beach beneath a palm tree. She is wearing a red swimsuit, has a blue lei around her neck, and a red hibiscus flower in her hair, wrists, and ankles. On the base of the mug in white lettering is “Tommy Bahama”. On the bottom of the mug is “Tommy Bahama”, “Vacation Vixen”, “2004″, and “Hand Made in China”. Also, impressed on the bottom is the letter “W”. Tommy Bahama has released a series of mugs featuring a wahine, one each year, since 2002. This mug, titled “Vacation Vixen”, was released in 2004. Others include “Kimono Lady“, released in 2002, “Tropical Nostalgia” in 2003, “Just Duet“, released in 2005, and “Paradise Beach” in 2006. This hand-painted ceramic mug features, in bas-relief, a dark-haired wahine riding a blue marlin, which is leaping from the blue ocean. The waving wahine, is wearing a green grass skirt, red hibiscus flowers in her hair and on her ankles, and a top made from red hibiscus flowers. On the base of the mug in white lettering is “Tommy Bahama”. On the bottom of the mug is “Tommy Bahama”, “Paradise Beach”, “2006″, and “Hand Made China”. Also, impressed on the bottom is the letter “W”. Tommy Bahama has released a series of mugs featuring a wahine, one each year, since 2002. This mug, titled “Paradise Beach”, was released in 2006. Others include “Kimono Lady“, released in 2002, “Tropical Nostalgia” in 2003, “Vacation Vixen“, released in 2004, and “Just Duet” in 2005. This hand-painted ceramic mug features, in bas-relief, a wahine playing a ukulele. She is standing, against a tan background, under a palm tree on green grass. She is wearing a yellow grass skirt, a pink lei, and a yellow hibiscus flower in her hair. On the base of the mug in white lettering is “Tommy Bahama”. On the bottom of the mug is “Tommy Bahama”, “Just Duet”, “2005″, and “Hand Made in China”. Also, impressed on the bottom is the letter “W”. Tommy Bahama has released a series of mugs featuring a wahine, one each year, since 2002. This mug, titled “Just Duet”, was released in 2005. Others include “Kimono Lady“, released in 2002, “Tropical Nostalgia” in 2003, “Vacation Vixen“, released in 2004, and “Paradise Beach” in 2006. 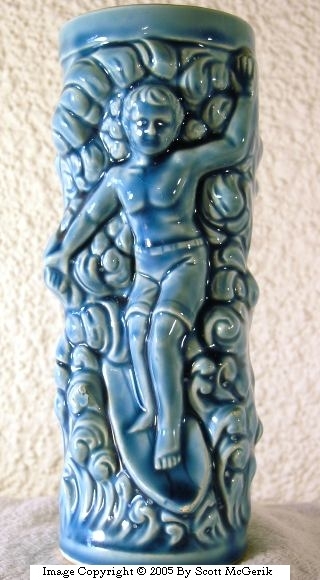 This ceramic figurine of a male drummer was produced by Treasure Craft. This long-haired drummer has flowers in his hair, several leis about his neck, and is wearing a flowered-covered skirt. On the reserve side of the base is “Treasure Craft of Hawaii” and “Maui”. This and similar Treasure Craft items can be found on page 62 of Treasure Craft Pottery & Pottery Craft Stoneware by George A. Higby. Found in the Figurine, Hawaiiana, Polynesian Pop, and Treasure Craft Collections.